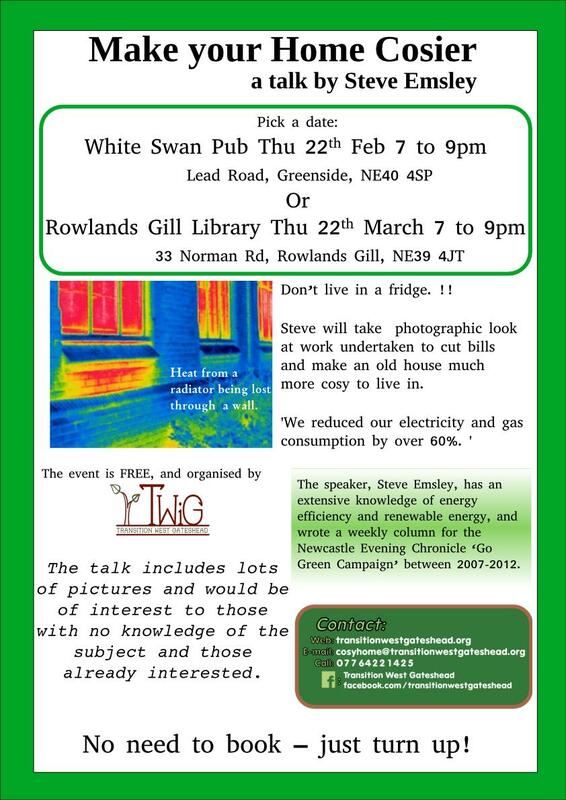 Come along to a talk to help you save money and save the world! The speaker, Steve Emsley, has an extensive knowledge of energy efficiency and renewable energy, and wrote a weekly column for the Newcastle Evening Chronicle ‘Go Green Campaign’ and was a founder of Transition Newcastle. He shares the steps he and his wife took to reduce their energy bills by over 60%! Some of these steps can be taken in a rented house, others are more in depth and relevant to home owners. The talk includes lots of pictures and would be of interest to those with no knowledge of the subject and those already interested. 2 chances – Feb 22nd in Greenside, Mar 22nd in Rowlands Gill. See attached poster for further info. Previous Post Reuse it or Lose it – great success!